A ring-shaped shackle for the wrist, which is one of a pair connected by short chain. Rotating arm backloads for speed cuffing. Material used to make the handcuffs i.e. nickel coated metallic with nickel finishing. Prevents the ratchet from advancing further in the closing direction. A mechanism which locks a handcuff pawl in an engaged position. 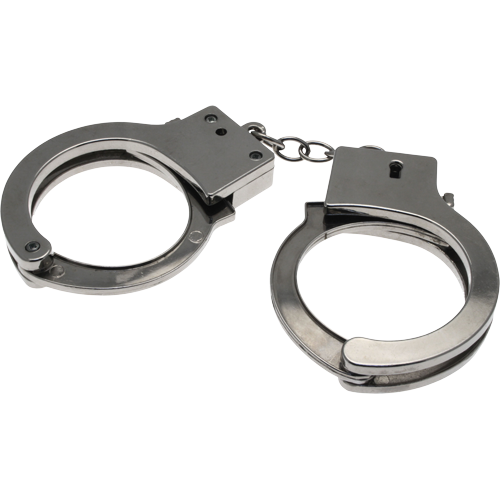 Dimensions: Each handcuff of each pair to have minimum opening of 55 mm for insertion of the human wrist. The inside perimeter of the handcuff to be a minimum 200 mm when the ratchet is engaged at the rist notch entering the locking mechanism. The inside perimeter of the handcuff to be a maximum of 165 mm when the ratchet is engaged at the last notch entering the locking mechanism. The maximum overall length of the pair of handcuffs to be 2200 mm. Show no substantial corrosion and to continue to function. Two standard keys with every handcuff.